If what you are after is the real thing, a true blue online bingo experience that replaces your local bingo hall, look no more. What could be better than playing at True Blue Bingo in the comfort of your home? The answer is quite simple, nothing! This is a newer online bingo site that opened their virtual doors in December of 2011. It’s an Australian influenced site that invites a large community of bingo players across the globe. The kangaroo advert is a sweet reminder of the land down under with a backdrop of blue crystal waters. You won’t have to watch out for crocodiles here, only bingo at its best. The site has a lot of promise with a homepage that is elegant yet simple. Navigating through the pages is done with ease and doesn’t require the necessity to register first. 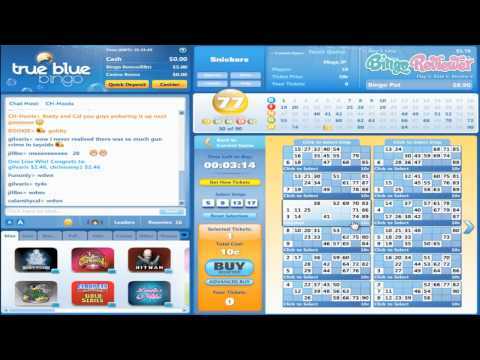 True Blue Bingo is launched by one of the true greatest software in the business, Microgaming. If you are familiar at all with online gaming, you’ll know that the games are top notch quality. The site is licensed and regulated by the Lotteries and Gaming Authority of Malta. The best of both worlds are combined with UK’s 90 ball bingo and the American classic game of 75 ball bingo. The bingo network joins rooms for fantastic linked games. These games offer bigger and better prizes because of large amount of participants. The bingo package is one of the best with Speed Bingo, Team Bingo and special Jackpot games. What is even more amazing is some games offer two Jackpots during the same game. Enjoy Progressive Jackpots and competitive games. Progressive Jackpots continue with casino games. Some of the most famous progressive slots around are here at True Blue Bingo with 6 slots in all to amass a huge cash prize. There are a total of 75 slots to choose from. Other games include Instant Scratchies, Video Poker, Blackjack, Roulette and Keno. Make sure to try one of the 22 Mini Games while you’re playing bingo and add even more excitement to your game. Take free ride on the house with a free cash to set you on your way risk free. Without a doubt players will be so amazed by the site they will make their first deposit after seeing the nice Welcome Bonus. Weekly and Monthly Promotions always keep the gaming fresh and alive with new offers always on hand. Chat Games offer lots of free cash prizes while having loads of fun with your bingo roomies. Choose your Bingo Ball for Life number between 0-90 and you’ll have a chance to win up to 1,000 cash a week. Bingo on a Full House game with your Bingo Ball for Life number and win up to 1,000 cash. Every time you play, every game you play will earn you Loyalty Points that can later be redeemed for real cash. There are four bonus tiers of loyalty. The more you play the higher up the tiers you’ll climb for bigger and better benefits. There is a multiple of Jackpots available. The unique Bingo Ball for Life feature is an excellent incentive to win lots of extra cash. We rate True Blue Bingo with 3.75 Pink Hearts. For me, this site had some good aspects and some not-so-great ones. For starters, I found their registration process to be quite simple. It was quick and easy and I was able to start playing in no time at all. On the other hand, I was not overly excited about their welcome offer. They start new players off with a $5 no deposit bonus. You can’t really get too far on that, but then again, it IS a no deposit offer so I won’t complain too much. Another thing I was slightly disappointed with, was their selection of bingo. They offer only two variations: 75 and 90 ball. These are the classics and I am happy to play them, but I do like to mix it up every once in a while and with only two types of bingo offered, it’s kind of hard to do that. Despite this, their jackpots are very nice and their promotions are outstanding and for this reason, I continue to play at the site. True Blue holds the line for the fine Aussie casino sites, and although there aren't many of them, they are all really good. This one uses Microgaming platform, and it is one of the best around (if not the best). I like this site's design, and it looks simple, but you can find everything you want in just a few clicks. I like the fact that you have everything you need to know explained in just a few steps, and I don't think you will have any problems to understand the rules. One of the first things I look for is the starting bonus, and you get a nice $5 to start with, no deposit needed, just what you need to explore the games before making a deposit. The welcome offer includes a 200% first deposit bonus (you have to make at least a $20 deposit in order to qualify). I wish they add a bit of variety to the classic 75 and 90 ball offer of bingo, but other than that, great site! I agree that their welcome offer is not exactly the greatest but I was happy that it was at least a no deposit bonus as well. Aside from this, I found them to have a lot of nice things going for them. They offer the classics when it comes to bingo, which is what I look for. You’ll mostly find me playing 90 ball anyway so I am not very picky. I was really happy with the pokies they have to offer here as well. There are over 75 pokies to choose. They also add new ones to the list frequently so there is always a new game to play. Another exciting thing they have to play here are linked games. These are available in both the Snickers and Ice breakers rooms and these games allow you an even better way to win big! Don’t miss out on a variety of chat games either.